LiveCode LessonsLiveCode LessonsHow To - LiveCode Mobile Tasks LiveCode Mobile TasksHow do I use the Date Picker View on mobile? 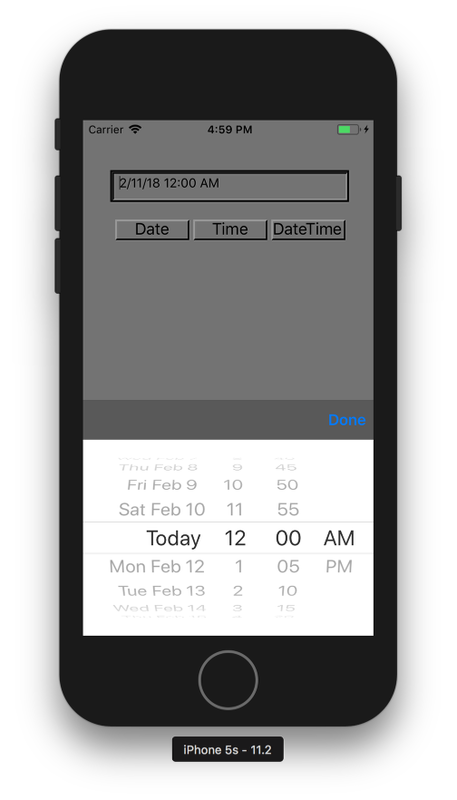 This lesson describes how to use mobilePickDate to set a date, a time or both a date and time. Screen captures and source code are provided. The command mobilePickDate provides a native date picker interface that allows users to set the date, the time or the date and time, depending on the parameters passed to mobilePickDate. The parameters to this command allow the selection mode, selection range, a current value and the minute interval to be specified. Parameters are specified in seconds since the UNIX Epoch, except for the minute interval, that is specified in minutes. The selected date and time is returned in the result variable. put "No Selection Made" into field "DateField"
put tDateResult into field "DateField"
This code does not provide any restrictions on the date range from which a selection can be made or provide a default date value. This means that the default date is set to the date at which the date picker is launched. The screen capture shows the pick representation for date selection and the result returned to field "DateField", once the date picker is dismissed. This code specifies a minute interval of ten minutes, providing a minute picker wheel with the values 00, 10, ..., 40, 50. Other settings are not provided. This means that the default time is set to the time at which the time picker is launched. The screen capture shows the pick representation for time selection and the result returned to field "DateField", once the time picker is dismissed. This code restricts the date range to a value between 20 July 2011 and 8 August 2011 from which a selection can be made. The default date is set to 29 July 2011. The screen capture shows the pick representation for date selection and the result returned to field "DateField", once the date picker is dismissed. Note: The dateTime option is only available on iOS. I'm using Live Code 5.5.1 for Android. Am I missing a addon or plugin ? no, you are not missing a plugin. The example you see in this lesson is for iOS. If you would like to use the date picker on Android then you should use "mobilePickDate". I see you are using "mobilePickDate" and "iphonePickDate" in your comment. "mobilePickDate" on Android also does not support as many features as are supported on iOS. This information is covered in the LiveCode dictionary. In particular, look out for the wording: (iOS Only). This indicates that a particular feature is only supported on iOS and not on Android. However, I dont know were to go from here to get the date picker to work. The Dictionary says --> "The default style on Android is "date"
So I dont understand why I'm getting the error since Android is supportd. Maybe a 5.5.1 version bug and I should open a Support Ticket with RunRev? Once more, thanks for your help. Thanks for the answer. However, still does not work. I believe it does not work with Livecode, Android version. It is a simple button with mobilePickDate command in the mouseUp handler! That is the entire stack. I opened a support ticket because if it is not supported by the Android version of Livecode, the documentation has to be changed. For the other side, following the documentation it does not work, so something has to be done. If I'm having this trouble, others may have too, right? that is odd. I tried mobilePickDate on Android and it launches the date picker for me. I was using an Android 2.3.3 simulator with LiveCode 5.5.1. If you launched a support ticket, please ensure you supply a sample stack with it, in case there is something wrong with the settings of the stack. The mobilePickDate command is only available on mobile, so in a simulator or on a device. This means if you try to use it on desktop, either in the IDE or in a standalone, you will get an error. You are right, it is a bug. I see you have added a comment to bug 11554. I have asked the Development Team to take a look at it to confirm whether it is a documentation or functionality bug. We will update the bug report when it has been investigated. In the meantime you might be able to use the convert command to format the date into the form you want.